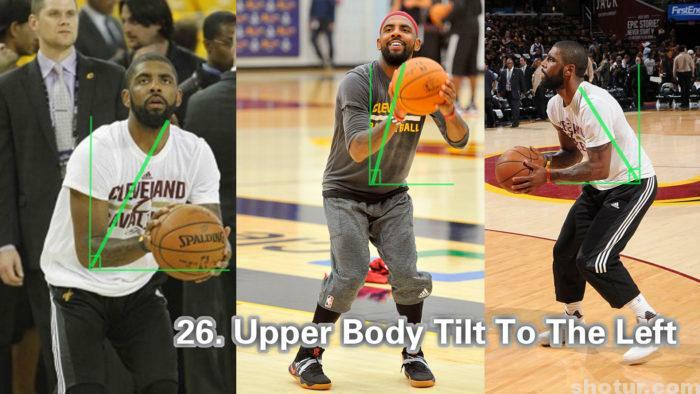 This post I will analyze Kyrie Irving’s shooting form with 33 tips. 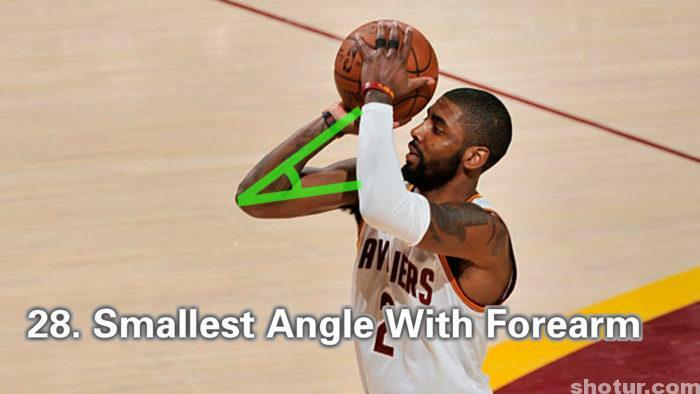 Kyrie Irving is a great basketball player, his shooting form is rational and scientific. 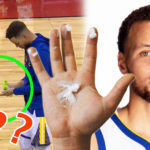 Kyrie Irving is a Top Level NBA Shooter, in NBA nowadays, there are only two top level shooters, another player is Stephen Curry, their 95% shooting tips are conform to the Straight Shooting Force Thoery. 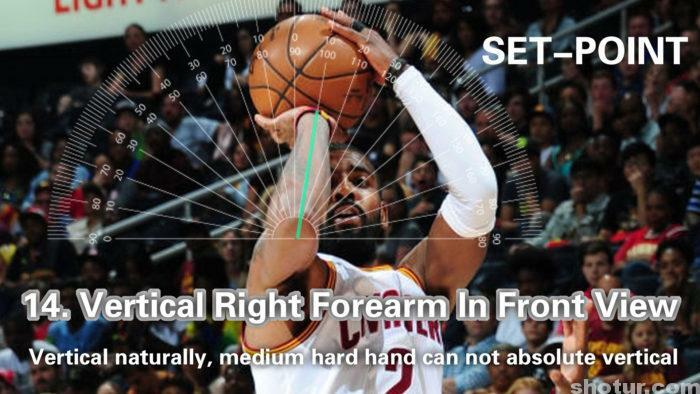 We said Kyrie Irving’s shooting form is scientific, what is a scietific shooting form? 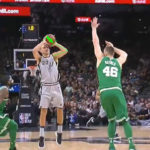 Make a natural and rational shooting force, all tips can be duplicated, all the tips we should to know why and it can help us to shoot a ball more accurate and physical, all the person can shoot with these tips, that is a scietific shooting form. 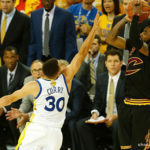 Many members on shotnba.com and here want me to analyze Kyrie Irving’s shooting form, so I will show you almost all tips of Kyrie Irving’s shooting form one time. Some tips I will tell you the principles, but some tips I will leave you to find the truth yourself, because the unknown is the impetus of our shooting training. In the past more than 10 years, I never stop my shooting training, just because I want to know why the NBA super star can shoot so accurate, is there a scientific way to make us all can shoot like a super star. In these days, I really felt very interesting, so I will not explain all the principles for the 33 tips. Just like we play a RPG game, we play to the end, just because we want to find the unknown denouement. The 33 tips include three phases: 16 basic tips, 12 advanced tips and 5 professional tips. If you played basketabll less than three years, you should better only learn and practise the first 16 basic tips, a good foundation will be very helpful for your basketball career. The 12 advanced tips, I suggest you’d better played basketball more than 3 years to learn. The 5 professional tips just fit for the players who played more than 8 years. Please remember we can just test 3 tips one time, you cannot test more tips once, that will be chaotic. Actually I suggest you just test and practise one tip in one day even one month, then you will have a better foundation. Now let’s begin. 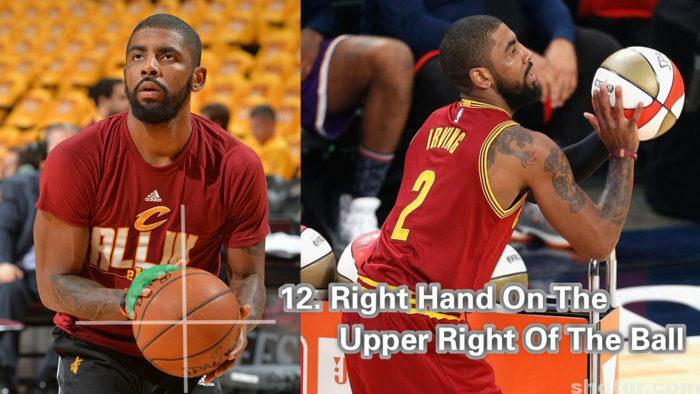 The first 16 basic tips of Kyrie Irving shooting form. The medium hard hand type have the most merits of soft hand and hard hand types. 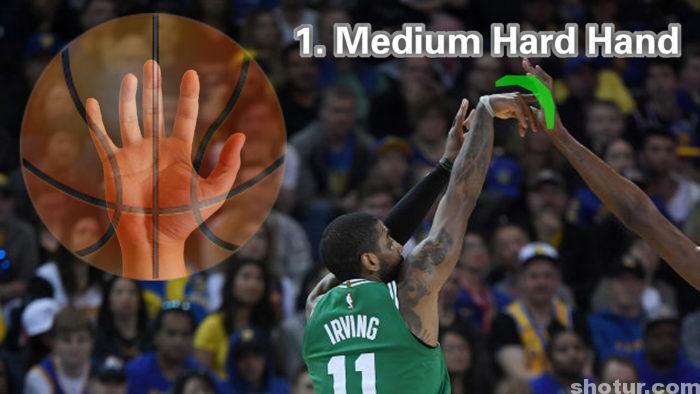 Kyrie Irving’s right thumb in a medium position, not too inward or outward, this hand type can hold the ball stable, the five fingers almost all in the same direction, this is very helpful for straight release hand force. Remeber do not leave any space in your palm. Before shooting, you should make your right hand be pressed to the max, when you start to release, your right wrist send all the force to your right hand, your right hand through a maximized swing, you can also add some upward force from your palm. All the five fingers synchronous make force to the ball. 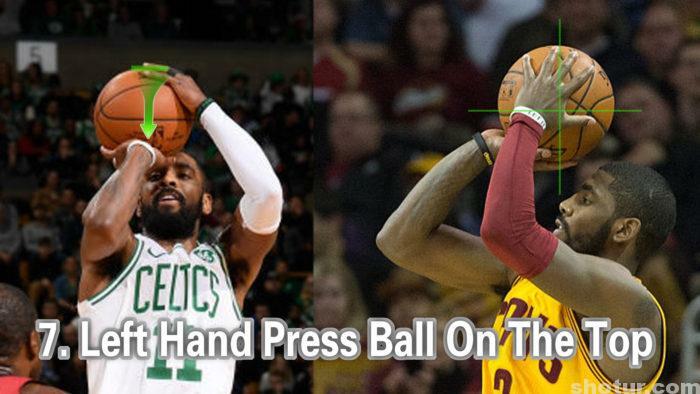 Many members asked me which finger lead the shooting force, Kyrie Irving’s shooting form is the middle finger lead, just because his forearm is almost vertical in the front view. This jump skill will lead your jump shot a good balance, the two feed jump up with the same medium force,the force can make your body keep balance in the hang time. 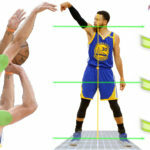 This jump skill can make your jump shot stable, but your jump shot height will be also can not be maximized, the high jump skill is one leg lead jump force, such as Michael Jordan’s most dunks and high jump shots. Remeber when you stand to catch the ball, your two heels must on the ground, dont only stand with your two tiptoes. This will make you stand very steady and easy to make a stabilized upward jump force. This is also a inward right tiptoe skill, but the range is a little small and easy to master. 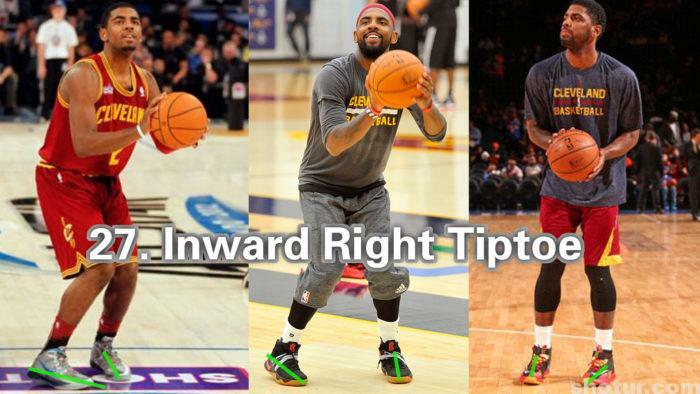 Kyrie Irving’s right foot need a little in front of the left foot. This will help your right shoulder in front of your body and shoot free. That means Kyrie Irving’s eyes will not follow throw after his release, our eyes should always look at the hoop even our shooting is finished. This will keep our head and our upper body immobile, our shots will be a little more stable in the hang jump shot. 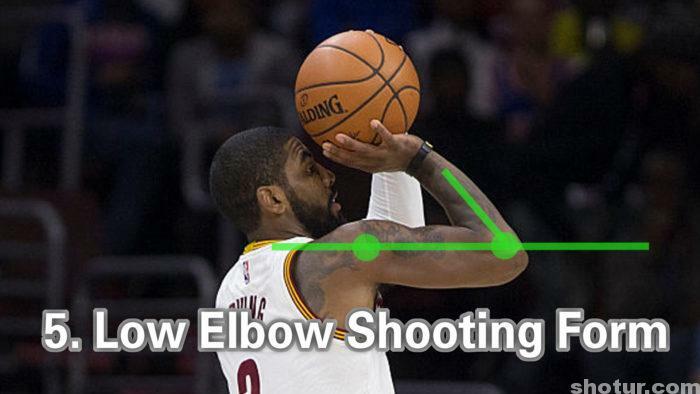 Kyrie Irving’s low elbow shooting form is fit for long shot even deep three. This shooting form is save energy, the torque is longer than the high elbow shooting form. The low elbow shooting form can also make your jump shot without the Upper Body Excessive Backwards problem. 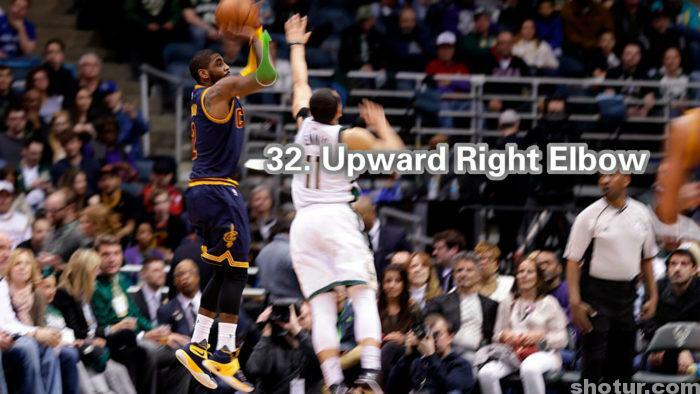 Kyrie Irving’s upward shooting force is good for three point. 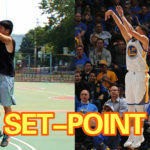 Nowadays, almost all NBA three point shooter shoot with the upward shooting force. This skill lead your shot with a high arc, relatively the hoop become bigger than the normal arc shooting. This skill is a little hard for many players, many members told me they could not find the method. Here I share you a knack, you can stand close to the basket, just take a standing shot, then your shot is a natural upward force shot. You can close your eyes and to feel your muscle and joints in the shooting process, your will easy to find the force path, remeber this path and try to shoot further and further. 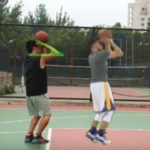 Many players felt their shooting force were not enough, and some players said their release force always do not accurate, many of these cases are caused by the left hand knack. 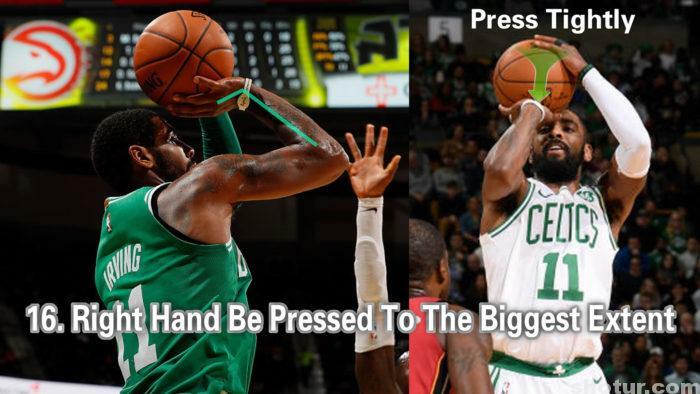 Your left hand should almost on the ball and a little forward, press the ball to your right palm tightly. After doing this, you right hand can shoot normally. 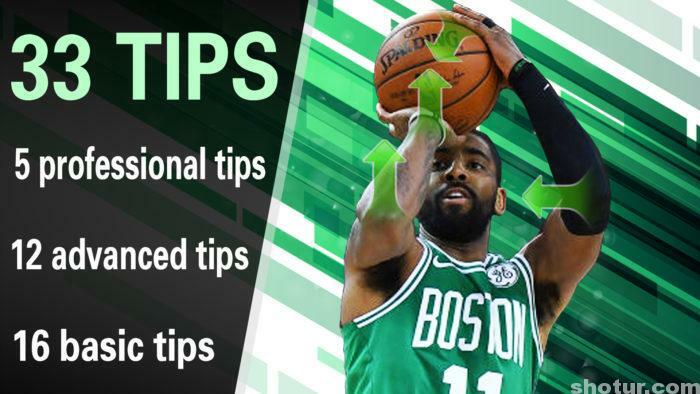 This tip is for Kyrie Irving release skill, when you start to shoot the ball, you should give the ball a straight force with you five fingers, the straight force is initiative toward the hoop. Combine the forces from your five fingers and your right palm in the straight force. When you start to release the ball, your left hand always on the ball, if you do not improve your skill, your left hand will be a little block your shot. 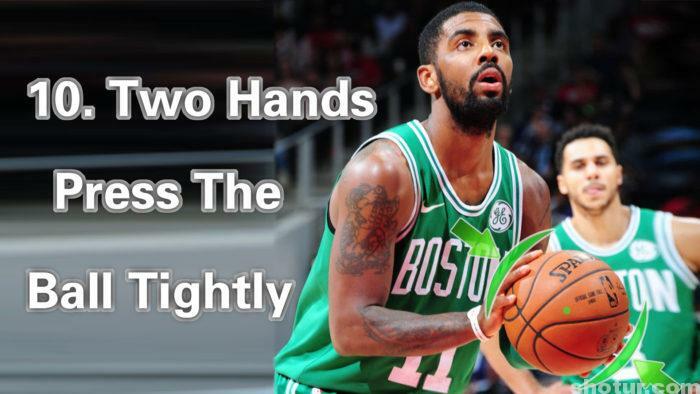 There are many methods to improve this, Kyrie Irving’s left hand always automatic helps his right hand force, not much, only a little. So in a long shot, your shooting force will be converged a little more. When you catch the ball to shoot, the two hands position and force is very important. We should press the ball tightly with our two hands from the two sides of the ball, the right hand always on upper right, your lefy hand is lower left. 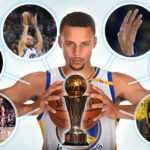 This tip is very important, we can see in the NBA 3 point contest, all the players could not catch the ball tightly in the first time, he always lost his shot. Catch the ball from left side of your body will lead your right elbow inward naturally for your release point. 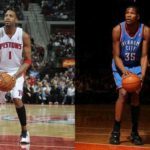 This skill is famous for many super stars, such as Tracy McGrady and Kevin Durant. 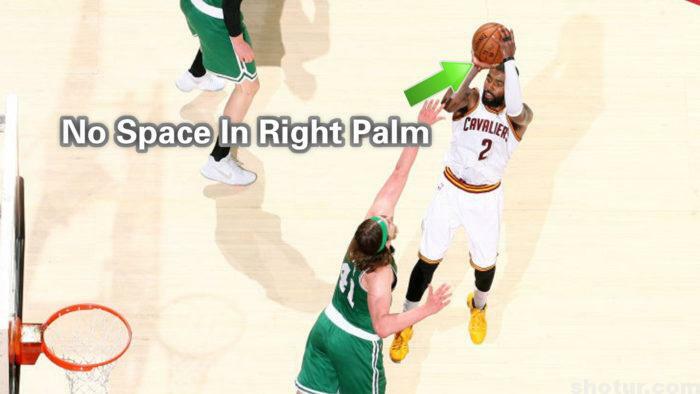 Kyrie Irving’s right hand position is a great shooting preparing motion, if you drop the ball down from your set-point with no change, you will find your right hand is on the same place. This catch ball skill is efficient for elevating the ball to the corect release point with no adjustment in first time. Then you can shoot faster than the others. 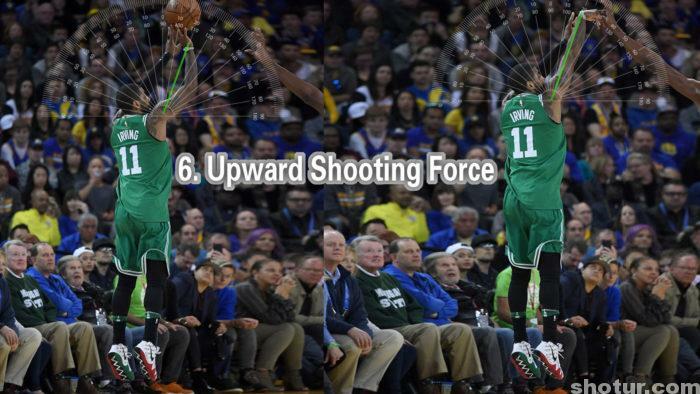 Kyrie Irving’s hang jump shot form will be more stable in the air than regular jump shot. Even in the air he can adjust his release posture to the best rlease point, so in a critical moment, especially in the NBA Finals, his jump shot always steady. 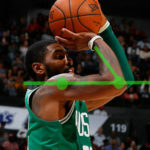 Kyrie Irving’s shooting style is shooting from shoulder form, his forearm almost vertical in the front view, this will accord with the straight force shooting theory. After you release the ball, you arm will be straight naturally, this means your shooting force is in a natural straight line. 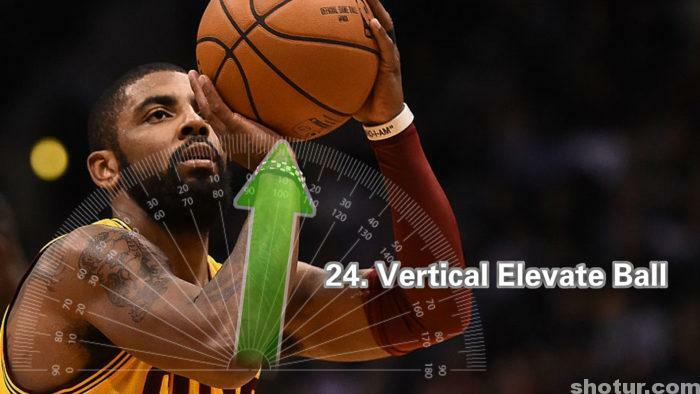 Kyrie Irving catch the ball posion is start from his abdomen, not between his two legs, the distance for elevating is a little shorter, this will lead your jump easily and you can make the release point in a short time and without a big inertia from elevate the ball. 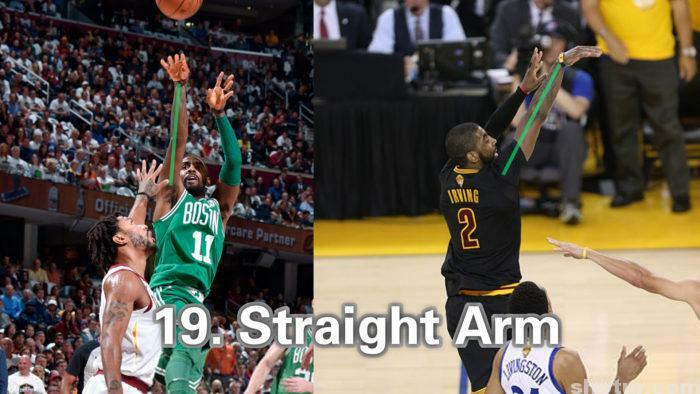 I have told you there are 3 spring forces in our shooting in the last logo-shot post, Kyrie Irving’s right hand and right forearm is combined to the first spring. With your left hand help, press the ball with a big force to make your right hand pressed to a big extent, then you can release the ball with a big force. 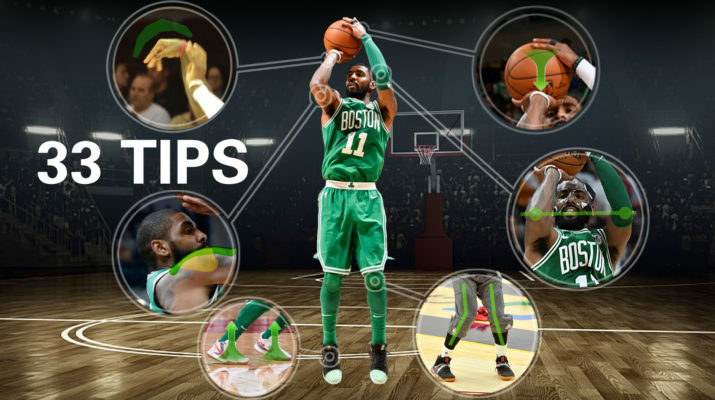 Kyrie Irving’s 16 basic shooting tips is all here, next let me show you the 12 advanced tips. 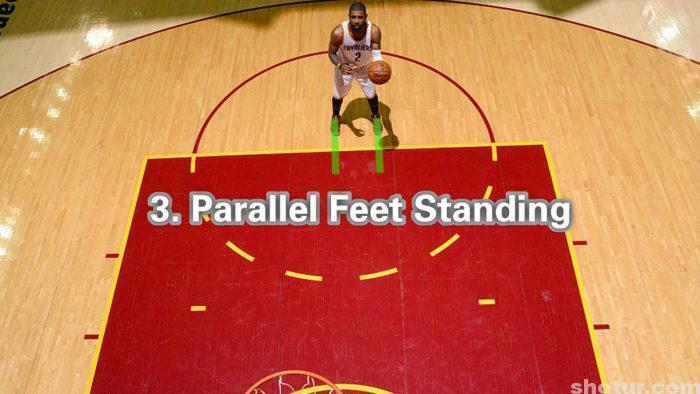 This is a good habit to keep Kyrie Irving’s upper body balance when he was shooting. 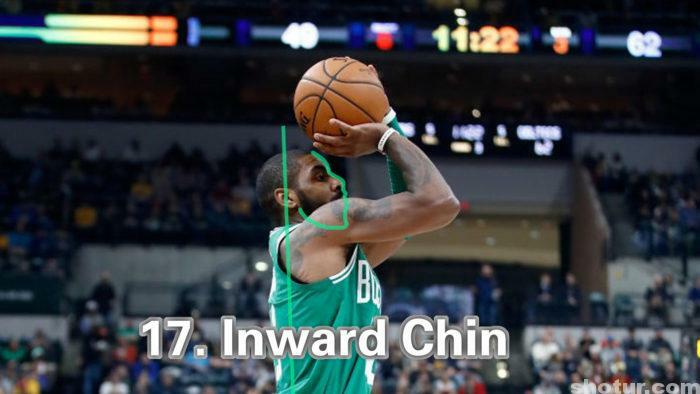 If your chin was outward that would make your face upturned, then your spine will be backward, your jump shot will be like a fade away, you know, this will make your shooting harder. 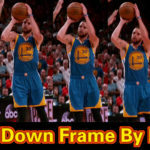 This tip is very popular in nowaday NBA,this elbow position will help you shoot in straight force easier, almost all your joints of your right arm in a vertical plane when you make release point. 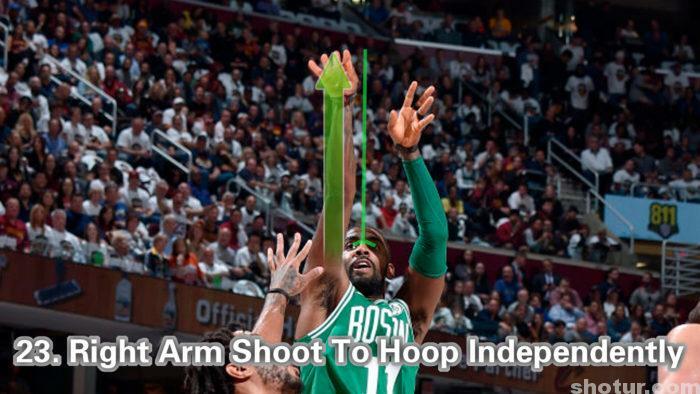 Kyrie Irving catch ball from left side of his body, this will lead his release point in the inward elbow shooting form naturally. 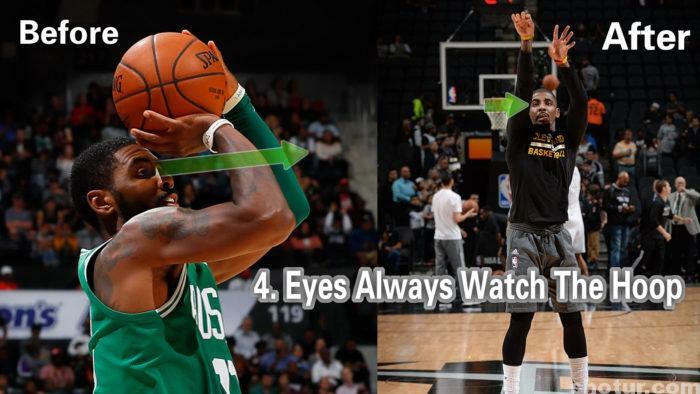 This habit also make Kyrie Irving’s shooting accord with straight shooting force theory. Straighten your right arm after you release the ball in every shot, your shooting force will be more straight, the release force can also be more steady. 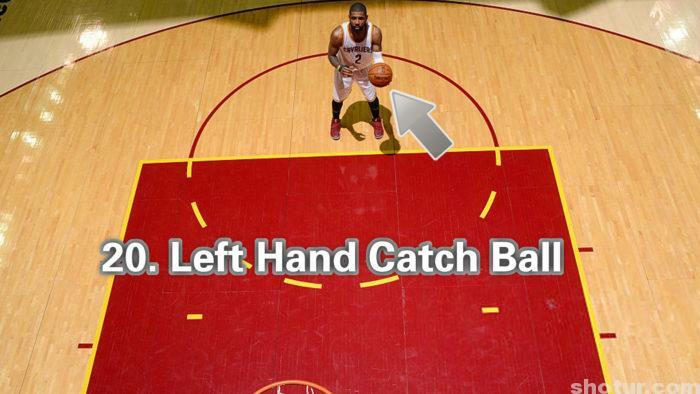 Kyrie Irving always catch ball with this skill, your left hand catch the ball first after dribbling, then your right hand put on the ball. 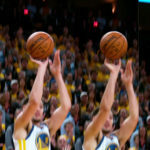 Doing this will help your right hand put on the correct position of the ball more easier, so many shooters catch ball with their left hands, the shooting average will always better in the game. 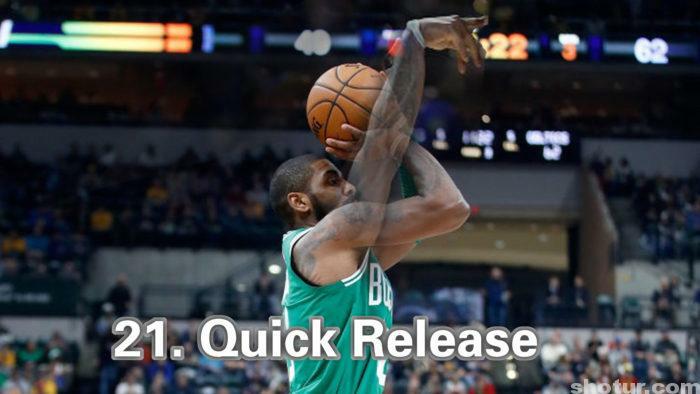 Many players think quick release will refuse the block, but actually all the tips we need just to help our shooting more accurate. 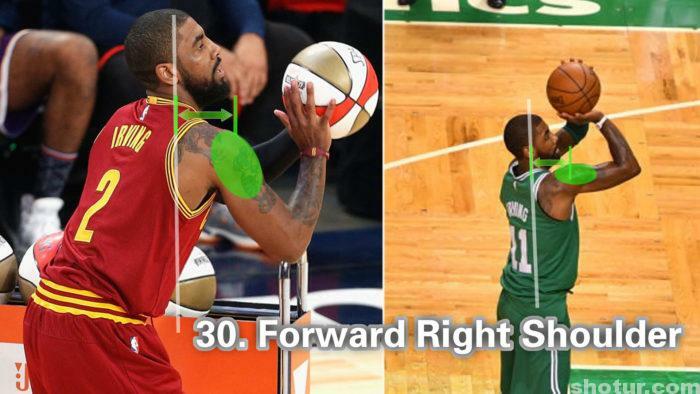 Kyrie Irving also shoot with the quick release skill, because this will help us to shoot with less force. When we take a super long shot, quick release will maximize the shooting force. 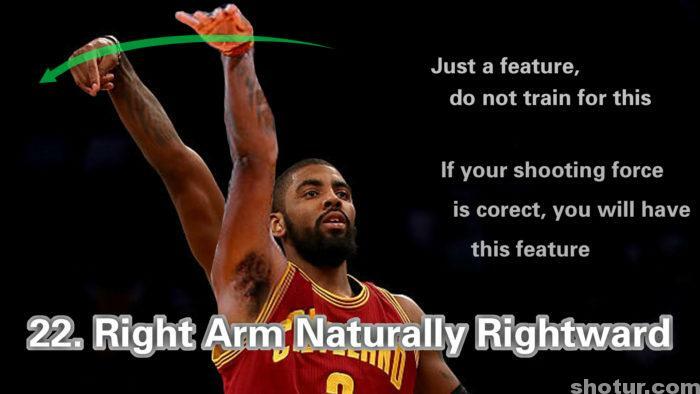 This is the feature of shooting from shoulder, after Kyrie Irving shooting, his right arm always rightward naturally. This is just because of the shooting force inertia, the shooting force start from our right shoulder, so our right hand lead the right arm a rightward force. This tip is also make your straight force better. 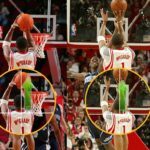 Many players thought they should shoot to the sightline, but actually our right arm just like a artillery, it has a aiming system for itself, so let the right arm independent to shoot to the hoop will make your shot more accurate. 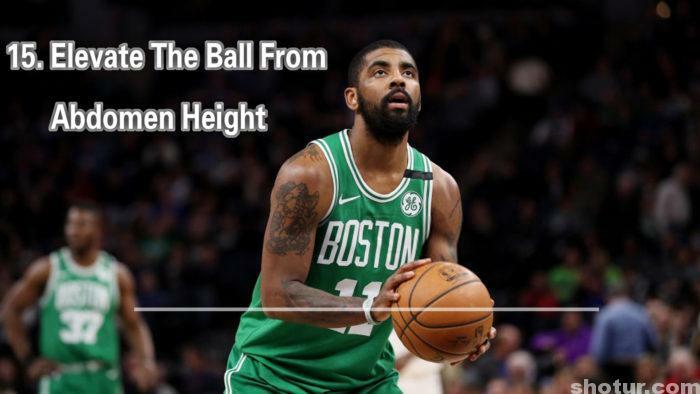 Initiative vertical elevate ball skill will help your release force in a straight line, Kyrie Irving’s elevate force and the release force almost naturally link up, his shooting force will not waste the energy. A good initiative elevating skill will also reinforce your release point. The front wrist skill will gather the forces from your five fingers into a smooth straight force, almost all great shooter release the ball with the front wrist skill. When you making the set point, your right wrist natural toward the hoop, then your five right fingers also natural aim to the rim. Then you release the ball, your hand will give the ball a natural straight force. 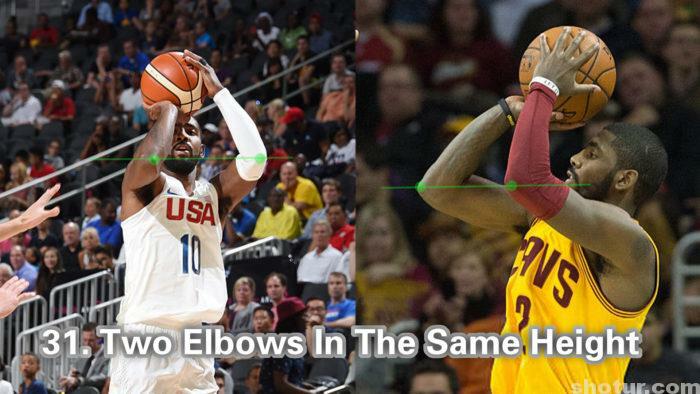 When Kyrie Irving catch the ball, his upper body always a little tilt to the left from the back view. This feature always appears on some good NBA shooters, this skill can help your jump shot more steady, after dribbling and jumping up, your upper body will not backward, and your right shoulder will a little higher than the left shoulder, your right arm will free to release. 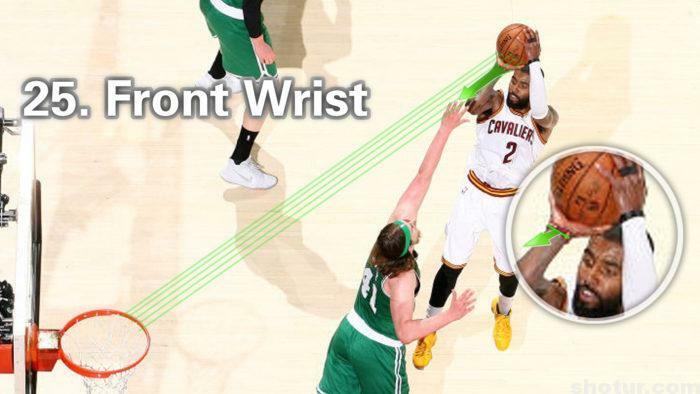 Kyrie Irving’s right tiptoe is inward, and his two knees also incurvate. The inward right tiptoe will help your right leg ahead and your upper body will be a little sideways, then your right arm will free to release the ball. This is the second spring force. 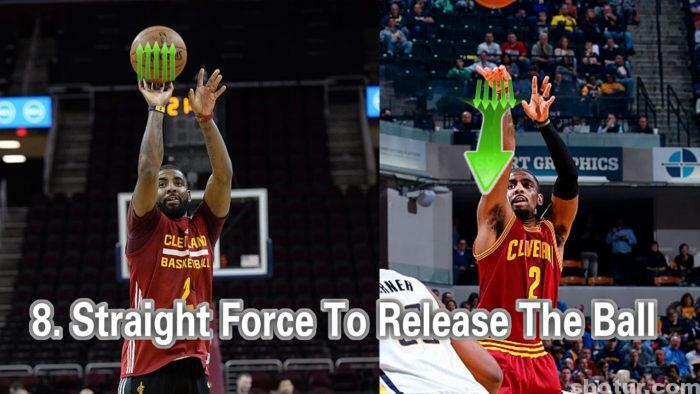 Kyrie Irving’s forearm and upper arm always into a smallest angle when he make the release point, this will lead your arm give the ball almost the biggest release force, just as a spring. The 12 advanced tips are all here, next I will show you the 5 professional tips. Not only for jump shot, the free throw also should be. Actually this is a feature of your right shoulder force skill, the shoulder force can neutralize the press power from your left hand. 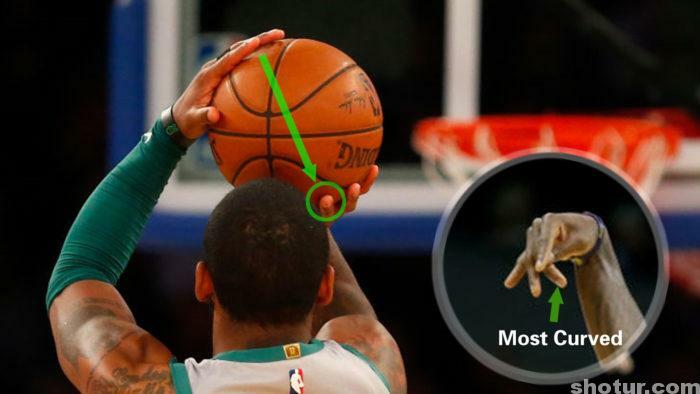 So when Kyrie Irving prepare to release the ball, his right shoulder always make a force to hold the ball stabilized. A great shooter always have some sideways range, because this will free your right arm to shoot the ball with no obstacle. 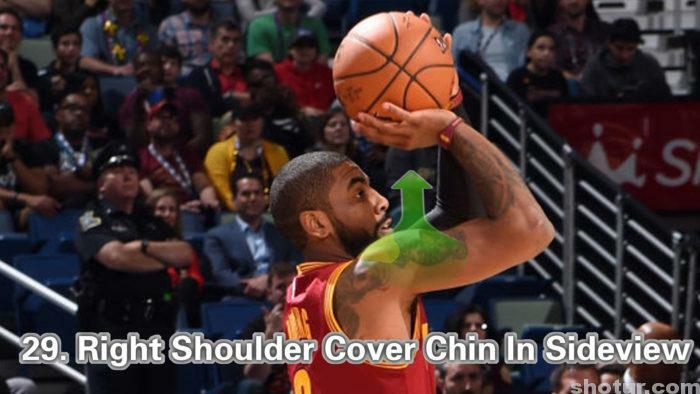 Kyrie Irving’s right shoulder position is good enough to take a long shot, adjust your shoulders position and remember it, this will help your shooting more comfortable. No problem, this will keep your balance in the air. Your two arms will hold the ball more steady, and when you shoot, because your two forearms almost in a same direction, your shooting will easy to find the straight force. 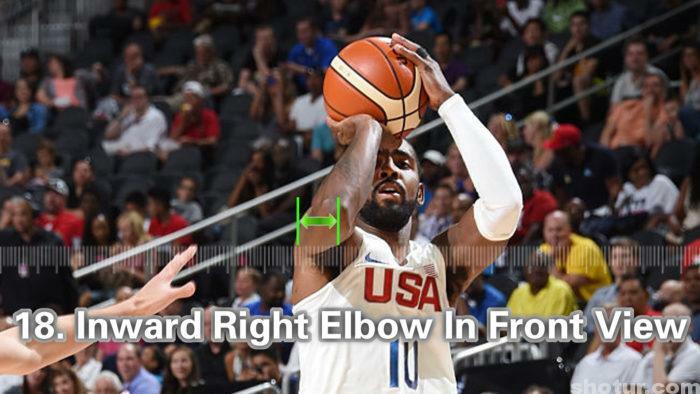 When Kyrie Irving release the ball, his right elbow will also give the ball a upward force, this helps his shooting with a high arc, and the elbow force can also help your shooting with less force. This skill can also neutralize the left hand pressed force. 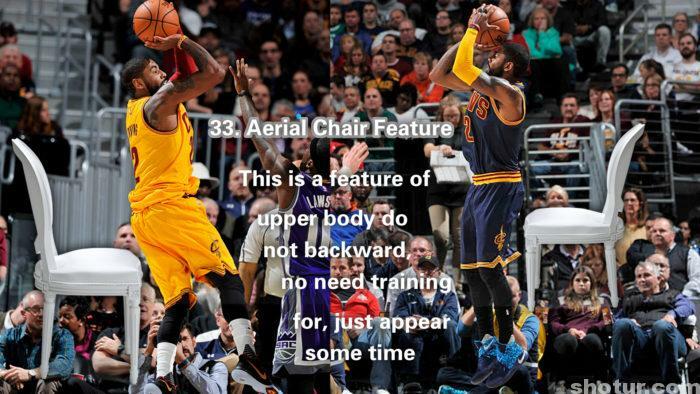 This is also a feature about Kyrie Irving’s upper body do not backward. We called this aerial chair, when you shoot with this force, some time you just like sit in the air. This feature all appears on some steady players, such as Michael Jordan. Now, all the tips I have show you. All these 33 tips I all have cyclic verified more than 5 times in my past ten years shooting training and I mastered all these skills. That means all the tips are summarized from my practising. 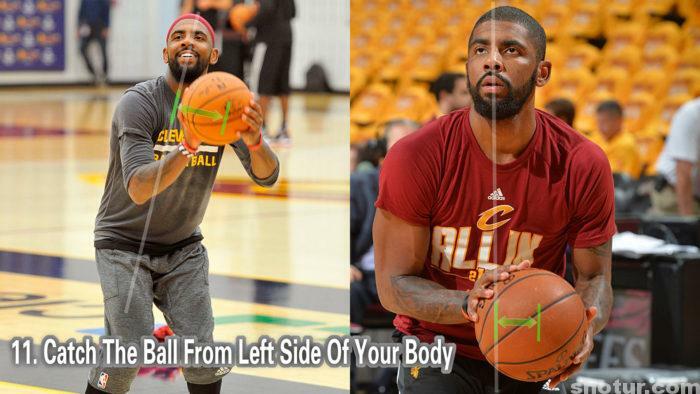 To imitate Kyrie Irving’s shooting form has two parts, the shooting posture and force, they are all important. 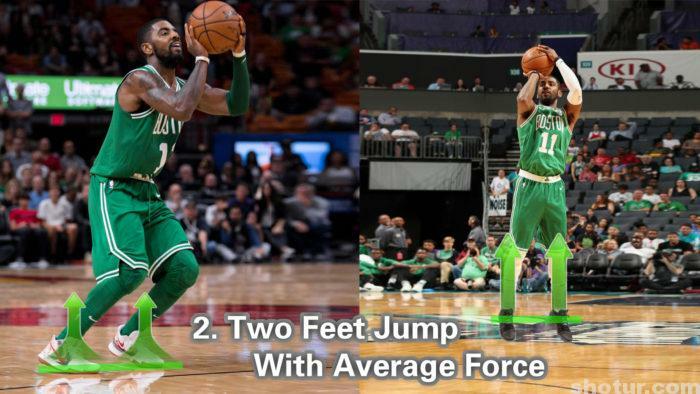 If you shoot with the right force, the feature of your shooting posture must similar to Kyrie Irving, and when your shooting posture is really correct, your shooting force will also very closed to Kyrie Irving. To test and improve you shooting skill, you must utilize the mirror, adjust your posture of the release point before a mirror, you’d better catch a real basketball, do not with empty hands. Make the correct posture more than 100 times one day, untile your muscle subconscious remember the feeling, then your release point will easy to fix. Make videos with camera in every single training day with four angles, front view, two sideviews and back view. After shooting training, just go home to check the details with Corel VideoStudio frame by frame. The purpose of our shooting training is improve the shooting form rationalized. Just remember a principle, when you adjusting your shooting form, if you feel some part of your body uncomfortable, you should adjust your posture to comfortable. Because every rational shooting form all will make your shot more and more comfortable, the shooting form fit in with your body structure, that is why we always said that just shoot a ball as comfortable as you can. 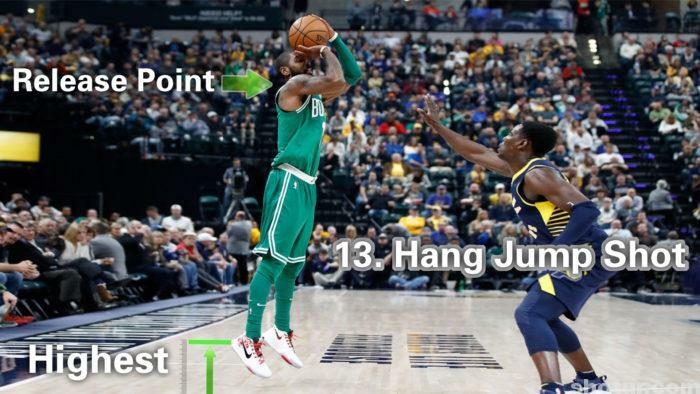 The Kyrie Irving’s shooting form with 33 tips I all have analysed, see you next time. Excellent! 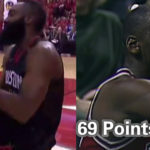 Make one about LeBro James. I will, just wait, may be several months. I’m Truely Amazed at your Research! 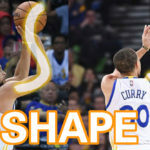 For the Upcoming Video, could you go In-depth about Steph Curry’s Form and give several Fitting Tips? 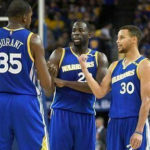 I will, but some short articles will be first to write, Stephen Curry and Michael Jordan’s skilll are the main subject of my website, I will write many articles for their skills. Unlike Other Researchers, you don’t sell your Knowledge. I need help on the rotation (backspin) of the basketball. The backspin is not straight and I think it comes off of my ring finger. How do I fix this? No matter what I try the rotation is always bad. Do you leave some space in your palm? 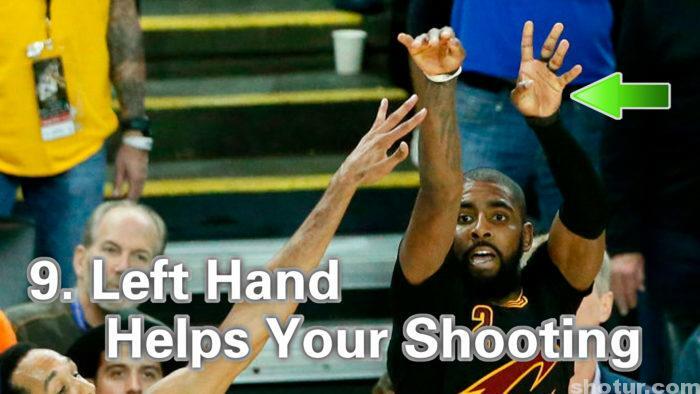 If you press the ball on the forepart of you shooting hand, even fingertips, your shooting hand will not stable. Try to make your shooting hand in horizontal plane naturally at the set-point, and release the ball with full hand force not only fingers. Can you explain the stephen curry sideways shooting some more please? Like how do I do it? Dont worry, just wait, the sideways tip is a large part of my shooting theory, I will explain the tip in many posts, such as Steph Curry and Michael Jordan.